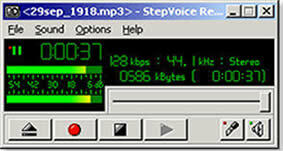 StepVoice Recorder is real-time recording software with MP3 file format support. It allows recording from any sound source, such as microphone, line in or any sounds currently playing on your PC (internet radio, movie sounds, etc.). Real-time mp3 encoding saves hard disk space and time, because you don't need to encode recorded sounds later. This feature is critical for longer recordings. 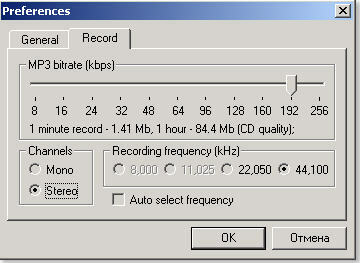 A wide range of mp3 bitrate settings allows to vary sound quality from telephone (3.5 to 7.0 MB/hour) to CD (3.5 to 7.0 MB/minute). With recording visualization you can easily adjust volume level to get best results.